JEFFERSON CITY, Mo. — Rep. Jay Barnes told two attorneys representing the Office of the Governor that he would get in front of them, get down on his knees, and beg for the Governor to testify, if that’s what it will take. The Chairman of the House Special Investigative Committee on Oversight pleaded during an open meeting on Wednesday morning for the committee to hear from Gov. Eric Greitens on matters they are investigating. The committee also reaffirmed their commitment to finding out the truth but pointed out that despite the governor’s continued promises to cooperate, he, and his office, has yet to do so. “We have been thwarted in our attempts to get at the truth by documents that have been objected to…We have also been thwarted in our attempts to get at the truth by refusal to testify,” said Barnes. Ross Garber and Ed Greim, attorneys representing the Office of the Governor, were unable to say if Greitens would testify. They were also unable to comment on when the potential testimony would take place, should he decide to present his side of the story. “That is a matter for the Governor and his private attorneys,” Garber told the committee. The taxpayer-funded attorneys, being paid a combined $660 an hour, testified for nearly two hours while under oath. “If the Governor refuses to testify, and I hope that’s not the case, are you going to accuse the committee of being unfair?” Barnes asked. The two attorneys were insistent that as the committee, and the legislature, moves into historic areas — possibly impeaching a governor for the first time in state history — that the process be “open and fair” with procedures established to find the facts. Part of the “open and fair” process Greim and Garber are pushing for would include public hearings for all witnesses and the ability for the defense to cross-examine the witnesses. That would mean that if the committee moves forward with events relating the governor’s extramarital affair in March 2015, the attorneys representing Greitens want to be able to publicly question the woman. The woman has yet to be named publicly, was not the one who came forward with the affair, and has requested anonymity. “The baseline is that someone should testify in public if we’re going to be using that testimony for impeachment,” Greim said. If impeachment proceedings take place, there is no indication which matters the committee investigated will be used as grounds for removal of office. In addition to the matters surrounding the 2015 extramarital affair, the committee is investigating The Missouri Continues’ donor list coming into Greitens’ possession, campaign finances, and other allegations surrounding the embattled Republican governor. One of the allegations the committee is looking into questions about a document with an unauthorized signature of another elected official — something the governor’s office chalks up to a technical mistake. An executive order issued Jan. 10, 2017 appeared online with the incorrect version of the Secretary of States’ signature. The Governor’s office claimed they used a pdf image of the signature for the webpage and they were using a practice the previous administration used to make the text searchable. The version on the website was not the approved version. 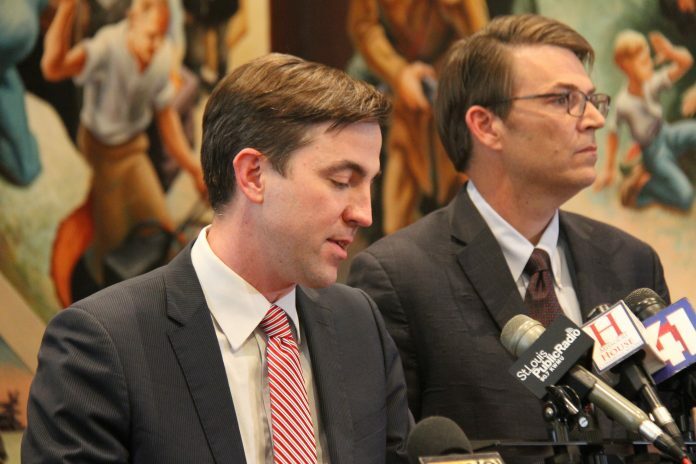 Greim said that there is no precedent in Missouri for determining how to proceed. Garber said from his experience — and proceedings in other states — that cross-examination should be allowed. In response to the “no precedent” comment, Barnes provided both lawyers with copies of the 1994 impeachment of Judi Moriarity. Barnes went on to tell Greim that if he wanted to argue for a new precedent in which cross-examination was allowed, do so without using misleading claims. Greim’s said calling the Moriarity case as the precedent a “slight of hand.” He cited that there were transcripts of the witnesses being cross-examined when the case was in the courts. The request for full power of subpoenas for the defense was not met with enthusiasm. Barnes pointed out that Ed Dowd — one of Greitens’ personal attorneys — recommended the committee talk to a witness, and they immediately did. He went on the say they will call witnesses that are relevant. That the committee wants to hear from any witness that has knowledge and facts — including Greitens. The committee expressed commitment to moving forward in a fair and transparent manner but offered no definitive answer on the procedures for the continued investigation. The special session is set to begin at 6:30 p.m. on Friday. Garber stated his interest was working to make sure that the Office of the Governor is not “diminished” in any way for future office holders. Barnes contended the House should take the position that “they ought not act in a way that diminishes the constitutional obligations and authorities” of the legislature. The roles of the attorneys in the process was a point the committee tried to clarify at the start of the meeting. The committee also sought answers to who was footing the bill, what the hiring process was, how long they had been on the job, and what that job description is. Both are being paid for through public funds. Greim is charging $340 an hour and Garber is charging $320 an hour — half his normal rate. Both were contacted for the position. Neither would commit to providing the committee with a copy their contracts but said they would consult with their client. Greim said he has been on the job a couple weeks while Garber could not recall when he started — Barnes pointed out they had a meeting with him and Dowd in March. Garber only recently turned in his first time sheet to be paid but said his firm normally bills once a month. Greim said while normally billing once a month, with a case like this, it will probably be more frequently.